Home» AP LATEST UPDATES » AP LPs/PETs working in Municipal Schools Upgradation of SAs Amendment Orders as per G.O:82. AP LPs/PETs working in Municipal Schools Upgradation of SAs Amendment Orders as per G.O:82. AP LPs/PETs working in Municipal Schools Upgradation of SAs Amendment Orders as per G.O.MS.No. 82, Dated: 16-05-2017,AP Upgradation of Language Pandit Grade-II and Physical Education Teachers working in Municipal Schools to that of School Assistants Amendment Orders as per G.O.MS.No. 82, Dated: 16-05-2017,AP LPs/PETs working in Municipal Schools Upgradation of SAs as per G.O 82,AP Upgradation of Language Pandit Grade-II and Physical Education Teachers promoted as School Assistants in Municipal Schools Amendment Orders as per G.O.MS.No. 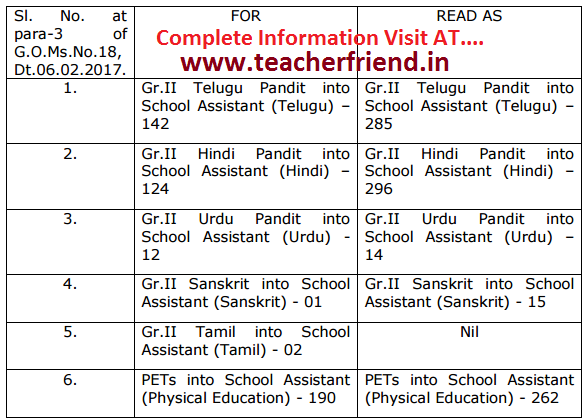 82, Dated: 16-05-2017,APupgradation of 471 posts of i.e., Language Pandits Grade - II (281) and Physical Educational Teachers (190) posts working in Municipal Schools to that of Schools Assistants as per G.O:82. AP Upgradation of Language Pandit Grade-II and Physical Education Teachers working in Municipal Schools to that of School Assistants in Municipal Schools Amendment Orders as per G.O.MS.No. 82, Dated: 16-05-2017. G.O.Ms.No.18, Finance (HR-II) Department, Dt.06.02.2017. MA&UD Department’s e File No.24225/D1/2016, Dt. 07.02.2017. In the reference first read above, orders were issued for upgradation of 471 posts of i.e., Language Pandits Grade - II (281) and Physical Educational Teachers (190) posts working in Municipal Schools to that of Schools Assistants in the pay scale of Rs.28940-78910 in case of High Schools having a strength of 300 and above students, 200-300 and below students and 200 below throughout the state in first phase. The Municipal Administration Department shall take further necessary action in the matter accordingly.